We have heated, secure self storage units for all your storage needs including household self storage and personal storage space, located conveniently in the South Sound area of Olympia and Tumwater, WA, Thurston County. Contact us to reserve your local self storage unit today. 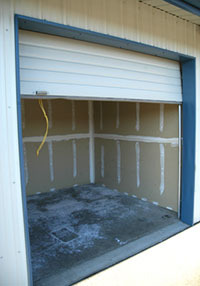 All secure self storage units have garage style 8 foot doors except the 5x10 units which have standard doors. Units have cement floors, are sheetrocked, and are insulated. At Airdustrial Mini Storage in Olympia, WA we have all the unit sizes to meet your self storage needs. Call (360) 943-4722 for availability and prices on our self storage unit sizes.